Kasumai Africa returns with an afternoon of exciting West African music and dance, 3:00 pm October 23 at the Northshore Performing Arts Center (NPAC) in Bothell. This year Thione Diop brings a collaboration of traditional African and American jazz performers to the NPAC stage, vividly demonstrating the African roots of American jazz and Brazilian traditional music. The first set will be Afro-jazz fusion and the second set traditional African, with a finale of the two joining together as one. Dancers are N’Nato Camara, Guinea; Etienne Cakpo, Benin; Fama N’Diaye, Senegal; Siya Manyakanyaka Kelley, South Africa; Dora Oliveira Newman, Brazil; Abdoulaye Sylla, Guinea; Karim Koumbassa, Guinea; and Manimou Camara, Guinea. Musicians, including Thione Diop, traditional Senegalese percussionist, are Magatte Sow and Gora Diop, Senegal, percussion; Karamo Susso, Gambia, 21 string kora ; Naby Camara, Guinea, balafon; and native born U.S., Leif Totusek, guitar; Naomi Siegel, trombone; Hans Teuber, saxophone and flute; Chad McCullough, trumpet; Brady Milliard-Kish, bass guitar; and Aaron Walker-Loud, drum set. Northshore Performing Arts Center is located at 18125 92nd Ave NE, Bothell 98011. 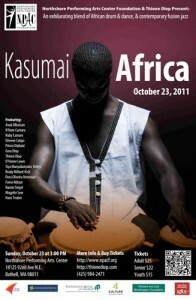 Ticket prices for Kasumai Africa are Adults/$25, Seniors/$22, and Youth under 17 yrs/$15. Tickets may be purchased online at www.npacf.org or by calling (425) 984-2471 Monday – Friday from noon to 4:00 pm. See some of the previous amazing performances under our videos section! Make sure to order your tickets early. The show completely sold out last time. You may order your ticketsonline or by calling the NPAC Foundation ticket line at (425) 408-7988.